Tell me if this scenario sounds familiar . . . . there is this great pair of boots, jacket, or purse you’ve had you eye on for quite some time. But, the price is out of your comfort zone. So, you watch and wait, wait for the next sale. If you have been watching and waiting for a sale to end all sales with lessons on Teachers Pay Teachers, you’re in luck! The TPT sale is Sunday and Monday – August 12th and 13th. I went scrolling through my store looking to see what might be lessons that are on your watch and wait list. I thought I’d do the math on a few of my bigger units to show you the savings with this sale. Would your class like to travel back in time to the 1800’s? Old West is the newest addition to my store. There are some great writing activities included in this unit. The lessons are aligned with 2nd grade Common Core Standards and other grades could easily use these lessons, too. It is 82 pages of wild west fun! Buggy for Reading are lessons you use with your reading group, homework, and literacy centers. The lessons are aligned with K-2 Common Core Standards. Click HERE to read my earlier post about this packet. This bundle packet is three levels in one. Normally these three packets would cost $15. The bundle price is $12. 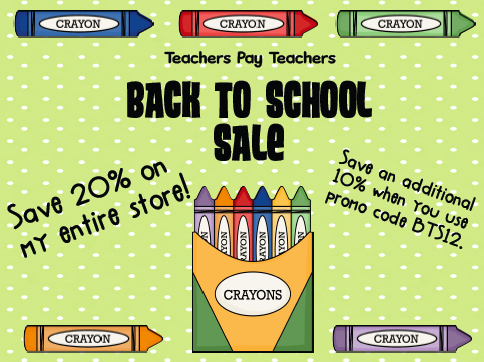 ***Please note: The Teachers Pay Teachers sale is August 12th and 13th which is when you get an additional 10% if you use promo code BTS12. My entire store is going to be 20% off August 11th – 14th because I have followers of my blog and FB page that live in different time zones. I hope by extending the dates you will be able to take advantage of these savings.